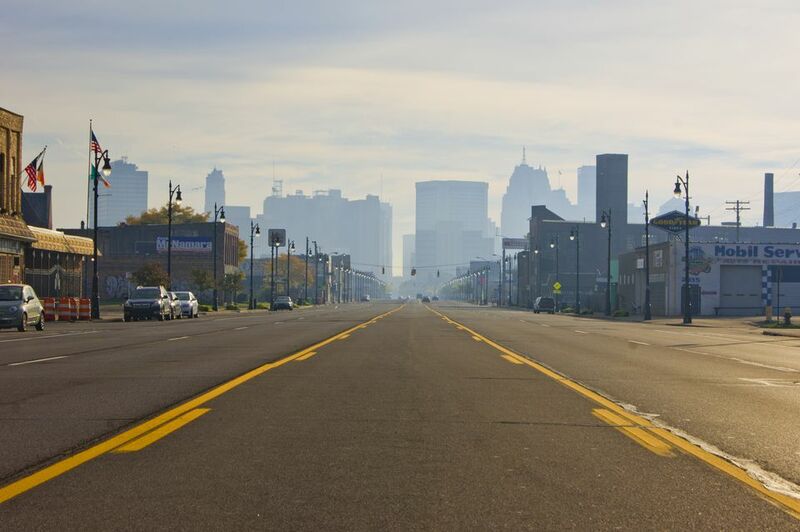 Detroit, Michigan, automobile capital of the U.S., is one of those places in the Midwest that you have probably told yourself, one day, if you get some free time, you will look up how long it takes to get there and motor on over there. It's the birthplace of Motown, the land of the Red Wings, the place where Lions and Tigers are both kings of the urban pro ball jungle (at least to Detroiters). Check out the driving distances to and from Detroit and various destinations across Michigan and the United States. The destinations are listed in order by travel time from Detroit. Detroit to Ann Arbor, Michigan, via I-94 W is approximately 45 miles and will take approximately 45 minutes. Ann Arbor is the home to the University of Michigan. Detroit to Toledo, Ohio, via I-75 S, is approximately 60 miles and should take a little over an hour. Famed for its glass manufacturing, Toledo is informally known as the "Glass City." Detroit to Lansing, Michigan, via I-96 W is approximately 95 miles and will take approximately 1 1/2 hours. Lansing is the capital of Michigan and home of Michigan State University. Detroit to Cedar Point Amusement Park, in Sandusky, Ohio, via I-75 S is approximately 113 miles and should take approximately 2 1/4 hours. Cedar Point is the second-oldest operating amusement park in the U.S. with 16 roller coasters, five of them are "hypercoasters" over 200 feet tall. Detroit to Grand Rapids, Michigan, via I-696 W is approximately 160 miles and will take approximately 2 1/2 hours. Grand Rapids, the hometown of U.S. President Gerald Ford, is also known as "Furniture City," for its history as a furniture manufacturing center. Detroit to Toronto, Ontario, Canada, via Sarnia is approximately 245 miles and will take approximately 4 hours. Toronto is the capital of the Ontario province of Canada. It is the largest city in Canada and one of the most multicultural and cosmopolitan cities of the world. Detroit to Niagara Falls, Ontario, Canada via Sarnia is approximately 250 miles and will take approximately 4 1/4 hours. Niagara Falls is famed both for its beauty and as a valuable source of hydroelectric power. Peak visitor traffic occurs in the summertime when Niagara Falls are both a daytime and evening attraction. More than 28 million tourists visit annually. Detroit to Mackinaw City, Michigan, via I-75 N is approximately 290 miles and should take approximately 4 1/4 hours. From Mackinaw City, you can take a ferry to Mackinac Island, a trip that takes approximately a half hour. Mackinaw City is the most popular tourist city in the state of Michigan. Local attractions include Fort Michilimackinac, the Old Mackinac Point Light, the Historic Village, and the retired US Coast Guard Icebreaker Mackinaw. Detroit to Chicago, Illinois, via I-94 is approximately 285 miles and should take approximately 4 1/2 hours. Remember that you gain an hour along the way as Chicago is on Central Standard Time. Chi-Town's time is one hour earlier than Detroit's. Detroit to Traverse City, Michigan, via I-75 N is approximately 250 miles and should take approximately 4 and 1/2 hours. Traverse City is on the shores of Lake Michigan’s Grand Traverse Bay. It’s known for the annual National Cherry Festival. Detroit to Pittsburgh, Pennsylvania, via I-80 E is approximately 285 miles and will take approximately 5 hours. Pittsburgh is known as both "the Steel City" for its more than 300 steel-related businesses, and as the "City of Bridges" for its 446 bridges. Detroit to Marquette, Michigan, via I-75 N is approximately 470 miles and will take approximately 7 3/4 hours. Marquette is the largest city of the state's Upper Peninsula. Marquette is a major port on Lake Superior, known primarily for shipping iron ore, and is the home of Northern Michigan University. Detroit to St. Louis, Missouri, via I-94 W and I-55 S is approximately 550 miles and will take approximately 8 1/2 hours. Known as the "Gateway to the West," built along the western bank of the Mississippi River, the city is commonly identified with its 630-foot tall Gateway Arch. Detroit to New York, New York, via I-80 E is approximately 615 miles and will take approximately 10 hours. The Big Apple is the most densely populated city in the U.S. It is known as the financial, cultural, and media capital of the world. It is home to the United Nations, an important center for international diplomacy. Detroit to Miami, Florida, via I-75 S, is approximately 1,360 miles and will take approximately 21 hours. Known for its beautiful beaches, electric nightlife, and amazing weather, Miami has one of the largest urban centers in the U.S.
Detroit to Los Angeles, California, via I-80 W is approximately 2,285 miles and will take approximately 33 hours. After New York City, Los Angeles is the second largest city in the U.S. LA is also famous as the home of Hollywood, a major center of the world entertainment industry.